Phish played 2 and only 2 shows in Oregon this summer, and they were back-to-back at the Les Schwab Amphitheater in Bend. It’s no surprise that, along with arguably one of the best line-ups it has ever had, Travel & Leisure is calling it one of America’s coolest outdoor music venues. Naturally the show sold out in minutes, along with almost all of Bend’s lodging for the week. We’re fortunate to have such great views, food, and entertainment options where we live. But with that comes the crowds who want to enjoy it too. Since security started blocking off the pathway across the river, lots of locals have switched to paddling on the river during the show. For some, this option seems to be even better than going to a concert in the actual venue. Even without the price difference (for those who already have a kayak, canoe, etc, it’s completely free), if you opt for the river you will be dealing with less crowds and can have a more relaxing experience. However, it’s not as easy as many of the tried and true river-goers make it look. Here are some tips to make your river excursion as enjoyable, if not more so, than going to the concert itself. Arrive early. Parking doesn’t come easy when there are thousands of additional people milling about the Old Mill (especially the Dead-head types who were hanging out at Phish). And when you’ve got to carry your paddle board, raft, kayak, or what have you down to the put-in area, you’ll be glad you did. Bring an anchor. Bungees, heavy objects, actual anchors… you can get creative. Whatever it is, you’ll be glad you have it when you’ve kicked up your feet in your boat and don’t have to be constantly paddling in order to stay near the amphitheater. Bring a jacket. We live in the high desert; the nights are cooler here, even in the summer, and especially in the water. Don’t forget your growler. Because what’s a summer evening in Bend without a tasty beverage? Up next we’ve got Wilco, Michael Franti, and Ben Harper. Unless you’re planning on buying tickets to all 3, you may want to opt for the river route. 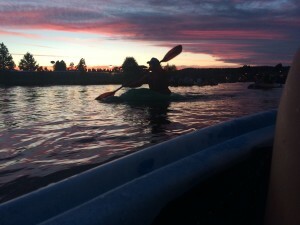 Done right, it can guarantee a lovely summer activity with a beautiful sunset to boot, as seen in the above photo. Happy concerting!